Fair Use Week Starts NOW! Celebrate FAIR USE this week (and every week). 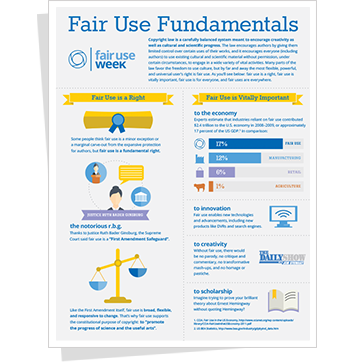 Fair Use Week starts today (February 22, 2016) and runs through Friday, February 26, 2016. Please note:Â Copyright law is a carefully balanced system meant to encourage creativity as well as cultural and scientific progress. The law encourages authors by giving them limited control over certain uses of their works, and it encourages everyone (including authors) to use existing cultural and scientific material without permission, under certain circumstances, to engage in a wide variety of vital activities. Many parts of the law favor the freedom to use culture, but by far and away the most flexible, powerful, and universal userâ€™s right is fair use. So, enjoy it while you have it.